Make this classic Central European dessert when summer's apricots are at their ripest, and serve with a glass of Riesling. In a bowl, mix together the eggs, ricotta, cereal, flour, and salt into a thick, wet dough. Let sit for 30 minutes. Bring a large pot of water to a boil. 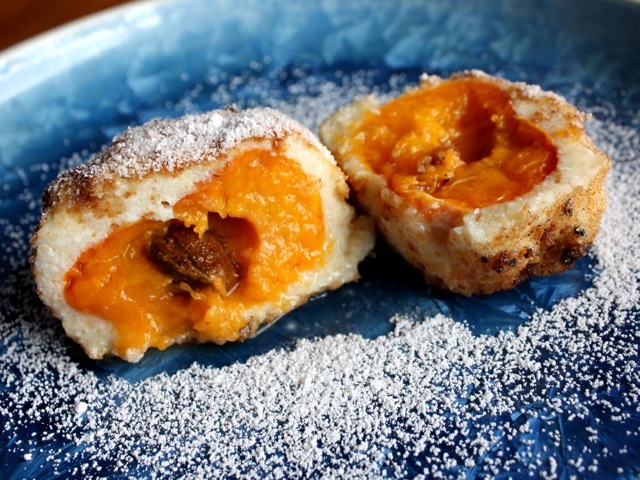 Pinch off a piece of the dough and roll it around an apricot; be sure the dough is completely sealed around the apricot. When the water is boiling and all the apricots are wrapped in dough, drop the apricots into the water. When they float (about 5 minutes' cooking time), scoop them out with a skimmer. Place on paper towels and let cool briefly, then roll them in the breadcrumbs. In a large skillet, melt the butter until it foams. Working in batches, add the dumplings and sauté until golden brown, then remove them from the pan. Add more butter as needed to give the dumplings an evenly golden coating. If you wish, roll the dumplings again in fresh breadcrumbs; otherwise, serve the dumplings hot, dusted with about a tablespoon each of confectioner’s sugar. Try to use smaller apricots for this dessert; they cook much faster. You can use instant or quick-cooking cereal, but it makes for a much wetter, gloppier dough that's significantly harder to work with.